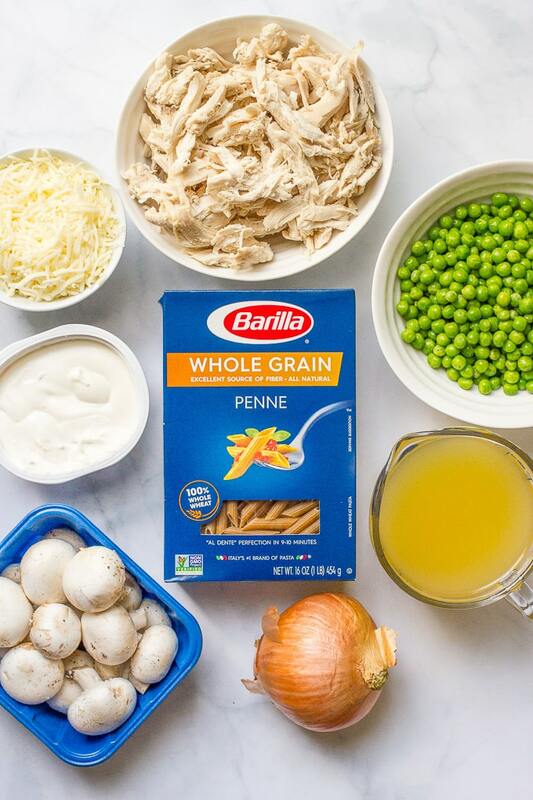 Creamy chicken and mushroom pasta with peas is an easy, one-pot complete dinner that’s ready in about 30 minutes! Hiya friends! I hope you had a great weekend! 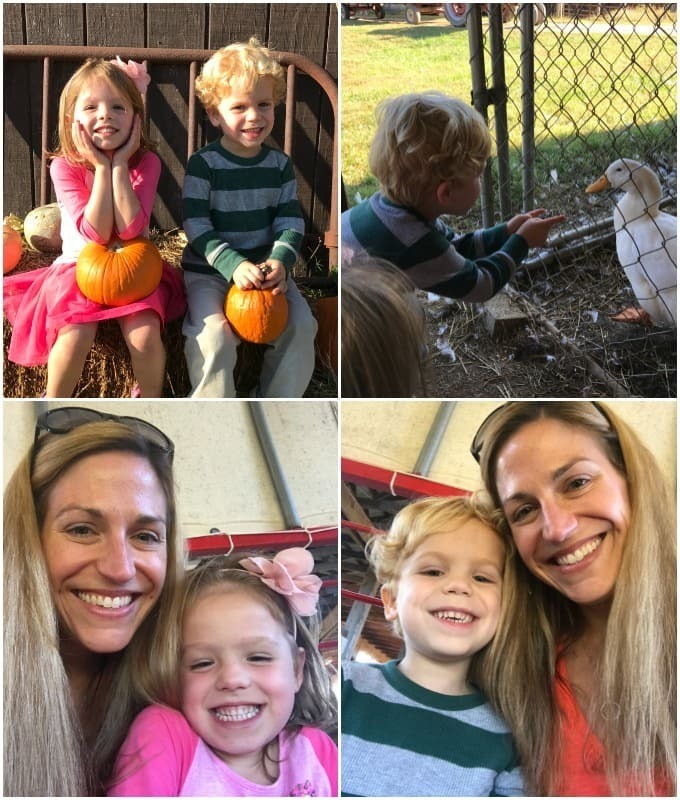 We did birthday party extravaganza on Saturday and watched some football and made it over to the pumpkin patch yesterday afternoon for hay rides and a farm tour. It’s been a fun fall tradition ever since M was 6 months old. This year, too, J was really into it. He’s ALL about the animals and anything farm-related, so it was a perfect trip. 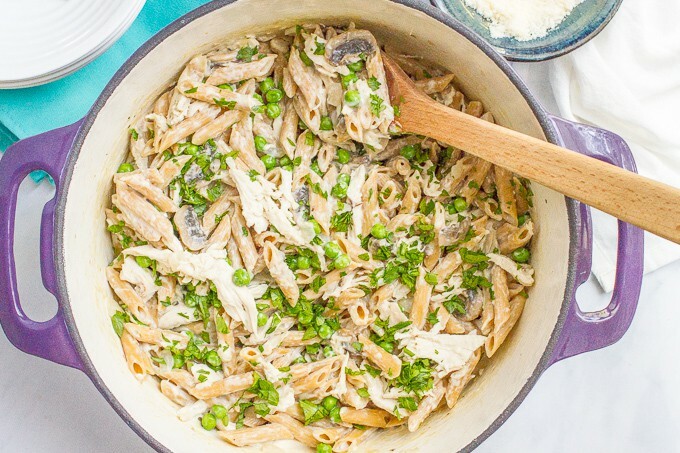 One-pot creamy chicken and mushroom pasta with peas is simple enough for a weeknight dinner but lovely enough for company — and it can definitely serve a crowd! In fact, I made it during a family beach trip this past spring. It was an easy one to pick up ingredients for when we were away from home and staying at a condo that didn’t have anything. And everyone — and I mean, everyone — went back for seconds. It may be because it’s so creamy with 3, count ‘em, THREE cheeses! And although that sounds pretty decadent, it’s overall a really light and healthy dinner. Oh, and easy, too. Always a win in my book! I’ve shared my one-pot vegetarian spaghetti with you already and in case you missed it, I have a one-pot pasta with sausage and broccoli that I shared over on my friend Shawn’s I Wash, You Dry blog. 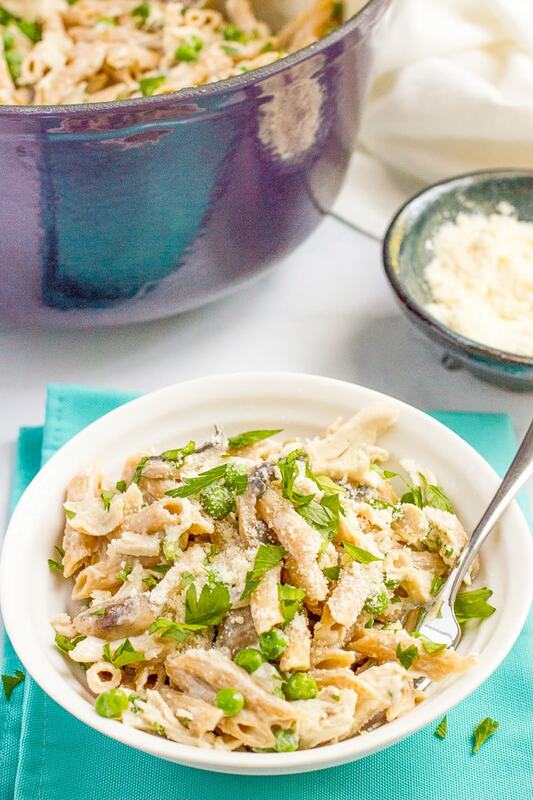 And today I’m bringing you another one-pot pasta favorite. This recipe calls for cooked chicken. I’ve used chicken that I did in the slow cooker and shredded and I’ve also used leftover roast chicken. You could use a store-bought rotisserie chicken as well. You can omit peas if you’re not a fan. I’ve done that before for a crowd and just served this with some roasted asparagus or steamed broccoli. You can also omit the mushrooms if you’d prefer. I think they add some heartiness and creaminess to the dish, but it’s still great without it. Like it spicy? Add 1/2 teaspoon red pepper flakes when you add the garlic and give it a kick. 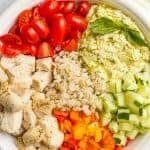 I hope you try this out for an easy, healthy, family-friendly meal. P.S. Check out my new VIDEO to see how easy this recipe is! 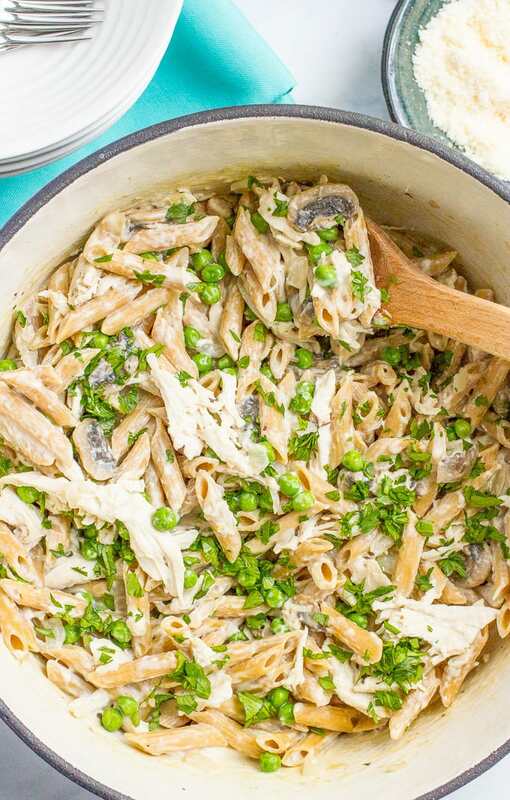 Creamy chicken and mushroom pasta with peas is a quick and easy, one-pot dinner! Heat olive oil in a large pot over medium heat. Add onion and mushrooms and saute for 7-8 minutes, until onions are tender and the mushrooms have released most of their liquid. Add garlic, salt and pepper and saute for another 30 seconds. Add pasta and chicken broth and bring to a boil. Cover, reduce heat to medium-low and cook for 8-10 minutes, until most of the liquid is absorbed and the pasta is nearly cooked. I lift the lid and stir it once or twice during the cooking time so the pasta gets moved around and can cook evenly. Add cream cheese and mozzarella cheese and stir until melted and well combined. You can add an extra splash of chicken broth if needed to get everything to mix well. Add thawed peas and shredded chicken and stir to combine. Turn off heat, cover and let sit for a few minutes. Serve with fresh chopped parsley and Parmesan cheese (if using). 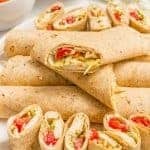 You can use chicken that’s been cooked and shredded in the slow cooker or poached on the stove or use a store-bought rotisserie chicken. I place my frozen peas in a colander and run them under cold water for a minute or two to thaw them quickly. 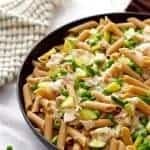 I’ve also made this recipe with gluten-free penne pasta and it turned out great. Sounds like you guys had a great weekend and your kids are just adorable!! Sweet pics! 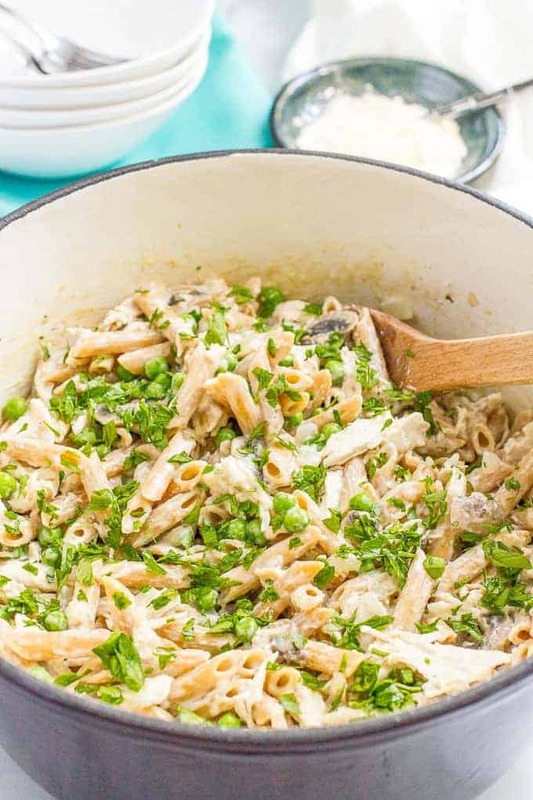 All about those creamy one-pot pasta dishes right now! Perfect comfort! I haven’t made pasta in a while, but this sounds awesome, and yay for less cleanup! :D! 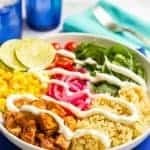 This dish looks so creamy and delicious!! Thanks for sharing!!! My kind of pasta, love it! 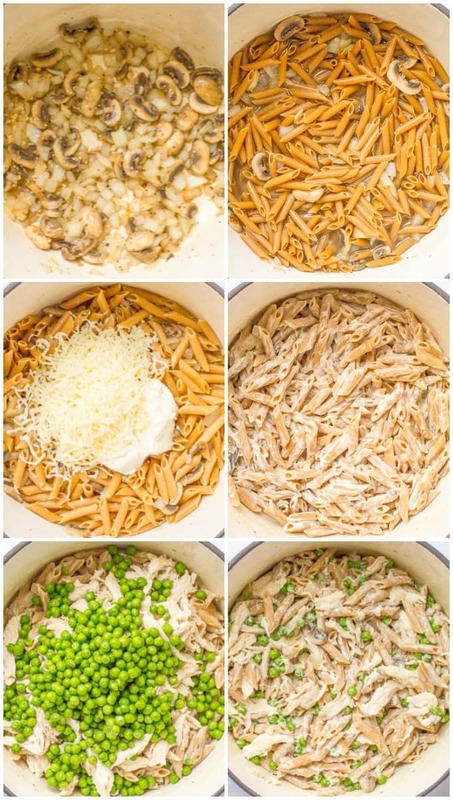 I am all about one pot dinners! Me too Erin! They are so great for busy weeknights! 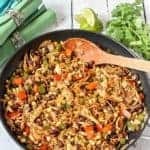 I have a two year old who LOVES mushrooms and this meal was a hit for the whole family! Thanks for sharing. Oh I’m so happy to hear you all loved it Lindsey! Thanks so much for sharing!